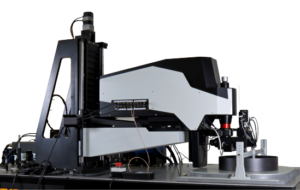 Special microscopes : custom designed two-photon microscope from our partner Femtonics. Femto-S Bridge is a special edition of the FemtoSmart microscope which is manufactured to have for extreme freedom in positioning of the body. It involves all advantages of the FemtoSmart series but it is extended to studies which need huge place for the sample or accessories therefore allowing functional brain imaging in head fixed mice navigating in a virtual reality environment. Beside of the large movement established by the elevator, the fine motions can be supported by the objective holding arm in a 50 mm range of Z direction. 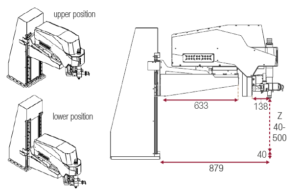 The piezo objective positioner allow the movement of the objective with fast Z positioning in several hundred micrometers ranges. An XY actuator can move the body relative to the column in X and Y direction (+/-25 mm range, step size: 1 um). Finally our tilting objective can further increase the accessibility to the side parts of the sample. In this FemtoS Bridge microscope, the foot is replaced with a lifting apparatus that provides an adjustable space between the microscope base and the top lens of the objective. The role of the modified elevating foot is to move the head along vertical direction. The moving range is 50 cm, the coarse Z-adjustment along the column is 1 mm. This elevator is situated outside of the workplace allowing an enlarged place below the Smart head. 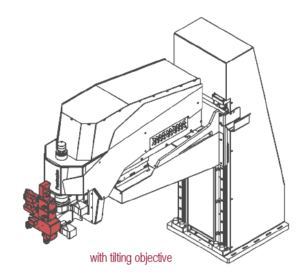 We provide the optimal combination of multiple height and working distance choices to address most animal models.